You will begin physiotherapy as soon as possible as it is important to start moving your new knee to promote good blood flow, to regain movement and muscle strength and to help the recovery process. You must be out of bed and walking initially with a Zimmer frame with the supervision of a Nurse or Physiotherapist within 24 hours of your operation. Perform these exercises as soon as you return from theatre.Repeat at least 5 times per day. Sit upright in your bed or chair. Take 3 slow deep breaths, in through your nose and out through your mouth. Keep your shoulders relaxed.Repeat every minutes you are awake. NB The most efficient way of preventing a chest infection is beginning to mobilise as soon as possible after your operation. Lying on your back, bend your non-operated leg and push through this and your arms to lift your bottom off the bed. Repeat as often as possible. Lying on your back. Pull your foot up and push your operated knee into the bed tightening your thigh muscles. Hold for 5 seconds Repeat 10 times. 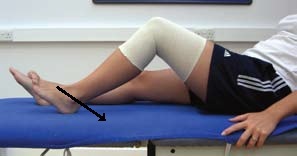 Place heel on roll (heel must be high enough so calf and knee are off the surface).Hold for up to 20 minutes This should be done when icing and resting your leg. You can also tighten and relax thigh muscle in this position. 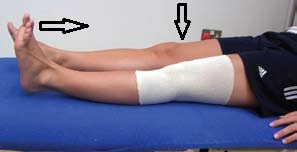 Lying on the bed, place a plastic bag under the heel of your operated leg and slide your heel towards your bottom, you can use your hands to obtain as much bend in your knee as possible. You may use a plastic bag or “doughnut” under your heel to reduce friction. Hold for 5 seconds, Then bend knee a little further before releasing, Repeat 10 times. Lying on your back, bend the operated knee slightly. Push your heel into the bed. Hold for the count of 10, Repeat 10 times. Place a rolled towel under your knee, pull your foot up and keep the knee in contact with the pillow whilst straightening the knee. Hold for 5 seconds. Repeat 10 times. Lying on a bed. Pull your foot up and brace your knee straight. 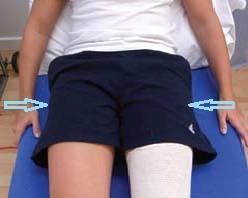 Lift the leg 5 inches off the bed keeping your knee straight. You should have your non operated leg bent up during this exercise. Hold for 5 seconds Then lower slowly back down to the bed. Repeat 10 times. Lying on your back. Squeeze your buttocks firmly together. Hold for 5 seconds. Repeat 10 times. Use walking aids to help you carry out your daily life until advised by your Physiotherapist. You should increase the amount of walking you do slowly and take regular periods of rest. Ice is used to reduce the amount of swelling, and can help to relieve pain. Do not use ice if you have cold allergies or circulatory problems. Do not put ice directly on the skin. On the ward the physiotherapist will show you how to use a Cryocuff. Before using ice make sure you have normal sensation on the knee. 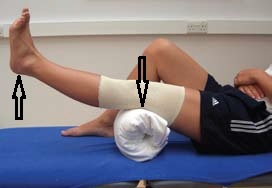 At home apply a bag of frozen peas or crushed ice wrapped in a damp towel onto the knee. Rest the ice on top of the knee, never rest the knee onto the ice. It is normal for the area to go red and slightly numb during icing. After the ice has been on for 5 minutes check the skin. If you notice that the area has gone white remove the ice immediately. If not, leave the ice in place for 20 minutes if you can tolerate it. Your Physiotherapist may provide you with a tubigrip which you should wear throughout the day. Elevate the area as much as possible to help reduce swelling. The most effective way to do this is by spending one hour in the morning and afternoon lying flat on the bed with your operated leg resting on several pillows.